Hello!! I’m Abella Arthur aka Psychic Jucy. A pragmatic psychic, tarot reader, astrologer, numerologist, coach, natural depth psychologist, and intuitive interpreter. Currently I’m researching and writing about all the tarot cards. As of this date, I’m almost finished the major arcana tarot cards — what a feat!! 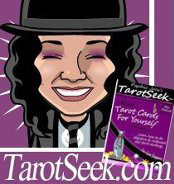 I’m also putting effort into a workbook for Psychic Jucy’s TarotSeek: Read Tarot Cards For Yourself, Volume 1. The guide is currently available for purchase and is *on sale now* without the workbook and comes with a free ebook updates and live help — just sign-up to the newsletter to get alerted about book updates. My next tarot writing project will be to continue work on Psychic Jucy’s TarotSeek: Read Tarot Cards For Others, Volume 2. Through writing, I have found that most tarot readers are teachers and generally don’t enjoy being taught by other tarot readers unless they believe they are miles ahead of them. Therefore, after doing the TarotSeek series — I’ll begin work on writing a different kind of tarot book that I hope will please other tarot readers. I may get some knickers in a knot for saying this but I don’t think tarot is the best use for long range or long standing predictions. It can be very accurate about the future but the people, places, and situations involved must be very fixed in nature for the prediction to remain fixed. If we are asking about an ex who has a mutable and changeable nature, anything the cards say about them now — may change later. For that reason, while I do use tarot for predictions — I rather use it to understand and know about things more deeply. And I feel the best way to do that is through yourself rather than a surrogate intuitive, like myself. And that’s what TarotSeek teaches! My mother and sister read the cards and more than likely many more of my ancestors. I took it up in 1996. I love Tarot the most because it includes other ancient wisdom such as astrology, numerology, and it’s a visual treat. Although I threw many a Tarot Party and gave a ton of private readings to friends, co-workers, and strangers I didn’t want to take anyone’s money stating, “It’s a spiritual thing” and it was my passion, my hobby. Well in 2005 when I was jobless and hitting a dead-end career wise, I looked at my bookshelf and saw a spattering of books and decks and remembered that people wanted to pay me for it — going so far as stuffing money in my pocket. And that’s when my professional readings and studies began. Although I share my wisdom with others, I consider myself a student — learner — more than anything else. And frankly the day I feel I can’t draw anything further from the tarot is the day my passion will have died.